View: The magazines are best viewed in Internet Explorer. In Firefox the fonts may go wonky. Not bad in Google Chrome. All magazines held have now been published. 1954 is now in text. The missing ones are now 1948 - 1950. If you can help, email for a postal address. Recorded Delivery recommended. They will be returned in good order. Also wanted, HM Dockyard School pre-war. There were eight army schools in Malta at this time. Teachers included eighteen army schoolmistresses who lived in barrack quarters or in furnished flats at Sliema and Floriana. Special sports meetings were held for children. During the Second World War only three army schools remained open and the premises suffered from aerial bombing like the rest of the Island. After the war, schooling at secondary level was provided for army children at the Royal Naval School at Tal Handaq, infant education continuing to be given at Mtarfa and St. Andrews. Tal Handaq was a former army barracks that had served as an anti-aircraft battery during the war. For those who had seen the film, its irregular distribution of box-like rooms and Nissen huts was reminiscent of the German prisoner of war camp at Colditz and it was inevitable that there would always be a teacher with the nickname HITLER. 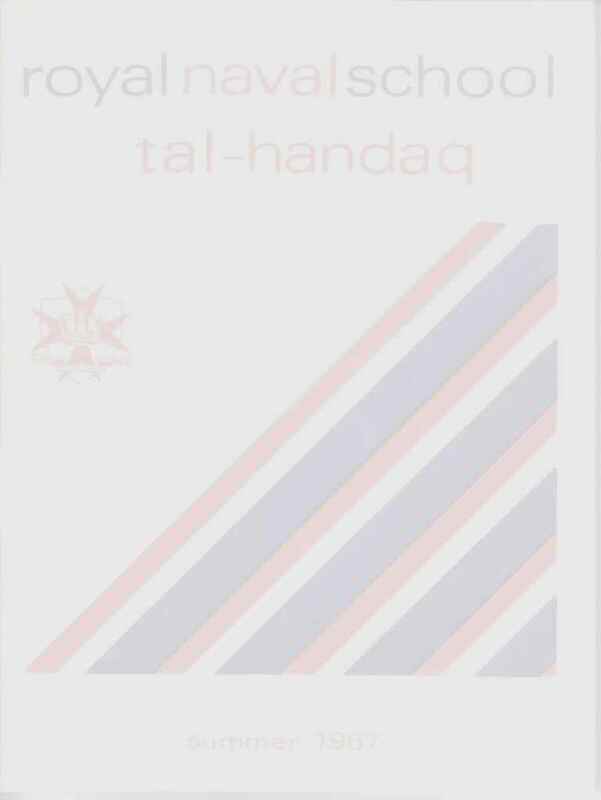 While accounts of army schools are fairly rare, much has been written about Tal Handaq mainly due to its enduring magazine which was published almost uninterruptedly between 1949 and 1978. A perusal of extant copies reveals much about life at the school, its educational achievements and student perceptions. Service schoolchildren coped fairly well with the constant changes in their lives. Their parents' moves to different stations did not always coincide with the school year and thus 'turbulence' as it was called was often created. Nevertheless visiting HMIs (Her Majesty's Inspectors) reported on the friendliness and versatility of the children. Tal Handaq was set in open countryside and its incidental open plan layout made it excellent for open air activities and sport in which the school excelled. Despite the discipline, the occasional ragging, schoolmasters in uniform, leaking Nissen huts, the notoriously steep steps to upper floors and NAAFI school dinners. Tal Handaq made a mark on the children's lives that would be recalled with pleasure in adulthood. All students belonged to houses and were asked to be loyal and competitive. For a decade or so students joined the British India Steam Navigation Company schoolships on educational cruises in the Mediterranean. The troopships that brought the men to Malta later carried their offspring on educational cruises! In 1969, single-service schools including the Royal Army Educational Corps (set up in 1946) were replaced by the Service Children's Education Authority. Only a handful of Maltese students attended school at Tal Handaq over the years. Nevertheless it was considered as a model school locally and Maltese student teachers used to be taken there to watch. Initially Tal Handaq was not a comprehensive school in the accepted sense of the word. It was divided into grammar and secondary modern but the transition from one to the other was easy. In 1964 the school became comprehensive, the distinction between grammar and modern was removed although some streaming remained. From the fourth year upwards pupils had individual timetables with a wide range of optional subjects which they could take in combination at different levels. In 1972 Services schools shut down, albeit temporarily during the impasse between the Maltese and UK government over the future of the military base. Later, with the eventual final closure being scheduled for March 1979, various schools started to close down, tuition being concentrated in fewer buildings. St. David's at Mtarfa closed in 1975 and the rest were gone by 1978, the final head count for Services schoolchildren for that year being 765. If 1972 had been a year of disruption for them the final years meant reduced facilities and the realisation that it was all going to end soon. Verdala, St. Andrews and Tal Handaq continue to serve as schools for Maltese children. St. Elmo became the Provost headquarters for the Royal Military Police after the Second World War. The building was demolished in 1978 in connection with the Valletta Ring Road Project. Floriana Garrison School was later taken over by the Maltese Inland Revenue Department. Army schools in Malta enjoyed much less public exposure than the Dockyard School. Fewer Maltese children went to army schools and those who did eventually took up different jobs. On the other hand, children of the Dockyard School moved on to jobs at the Dockyard and continued to be a homogenous, easily identifiable group. Interestingly, Malta was a naval exception since neither the Royal Navy nor the Royal Air Force had any schools of their own abroad before the Second World War. Unlike the Army, the Royal Navy granted marriage allowances for wives who remain behind so it did not provide married quarters or subsidise family passages. However, Malta, with its proximity to the home country was considered an exception. It was also cheap and it soon became a popular family station. Army children had enjoyed that privilege for well before that!